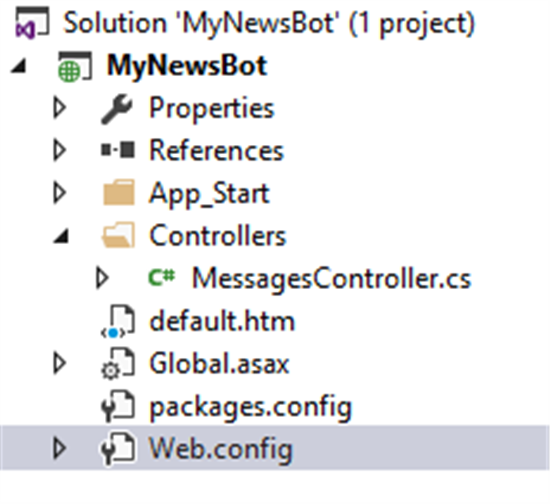 The following article introduces the concept of bots, demonstrates the basics of the Microsoft Bot framework and showcases how to build your first bot using the Bot Framework and C#. Conversational Applications or bots is a hot topic right now, is it really useful or it's just a hype? To answer this question, let's look at scenarios where bots are useful. 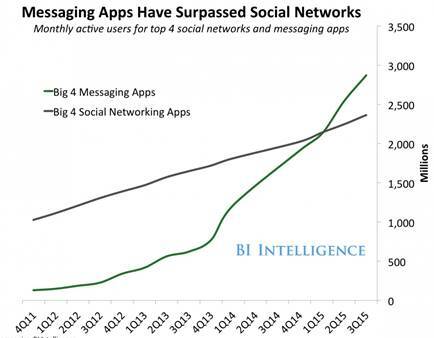 Messaging Applications. According to Business Insider, Text Messaging is the most used smartphone feature and for the first time in history, people are using more messaging apps than social networks. What if you could interact with your application via this interface? It is possible via bots! Moreover, bots can adapt and work on most devices and platforms like desktop, mobile, or social media like Facebook, WhatsApp or Skype. This will give your app a totally new selling point by interacting with your user using his favorite communication method and using his favorite platform! In scenarios where there's repetitive tasks such as a call center, bots can easily be used since there's lots of 'generic' answers. The flow as described below would be to handle the generic and most common requests and when there's a more difficult query, the bot transfers the call to a human. One of the tools to quickly build bots is the Microsoft Bot Framework. It is an Open source Bot Builder SDK which allows you to build simple to sophisticated dialogs; Cognitive Services enable your bot to see, hear, interpret and interact in more human ways. To get started with the Microsoft Bot Framework, you must first download the Bot Builder SDK here. 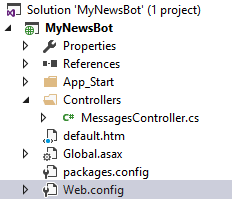 Follow steps below to set up the bot framework connector SDK .NET template in the Visual Studio 2015. 3. Save the zip file to your Visual Studio 2015 templates directory which is traditionally in "%USERPROFILE%\Documents\Visual Studio 2015\Templates\ProjectTemplates\Visual C#\". 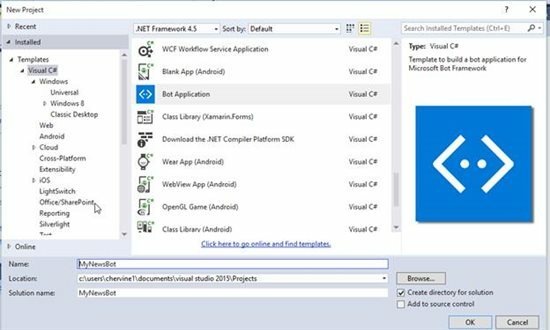 For example, "C:\Users\USERXX\Documents\Visual Studio 2015\Templates\ProjectTemplates\Visual C#"
In the Web.Config file, make sure the keys are as follows for debugging and run the project. These will need to be changed when deploying the bot. Once you click on connect, when you check the Log, it should return status 200, meaning that the connection has been established. Let's go back to the Bot Framework project to examine the code. The class here is the MessageController, this is where all the communication between the bot and the user will be handled. All the input received from the user will go through the Post method where the type of the activity will be identified which will decide how to reply the user. 5. Ping - An activity sent to test the security of a bot. Therefore, in the post method, you will check the ActivityType. If it is of type message, the bot will send a reply to the user and output the length of the text that he sent. Let's amend the code to send a welcome message to the user when he joins the conversation and triggers a ConversationUpdate activity. Now, let's run the code and see the results in the emulator. As expected, when a user joins the conversation, the bot sends a welcome message and when the user sends a message, the bots replies with the number of characters in the input message. The article demonstrated how to get started with Bot Framework and how to build your first bot. In the next article, the use of LUIS to add language understanding capability to the bot will be demonstrated.